Congratulations to Miki who earned the WBAC Grandprix Finals 2nd place award in Niagara Falls! 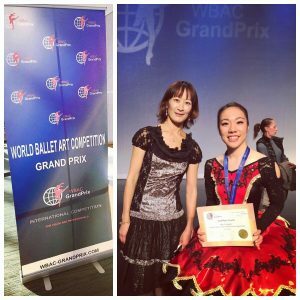 On November 10, our Pre-Professional Academy (PPA) student Miki Takasashi flew out to Toronto to participate in the Finals of the World Ballet Art Competition Grandprix. Having earned 1st place at the Seattle semi-finals, she entered the finals for classical ballet with Kitri’s Variation and a contemporary ballet, Crazy Horse, choreographed by Mr. Carney. Miki performed beautifully in both pieces, earning 2nd place for Crazy Horse.